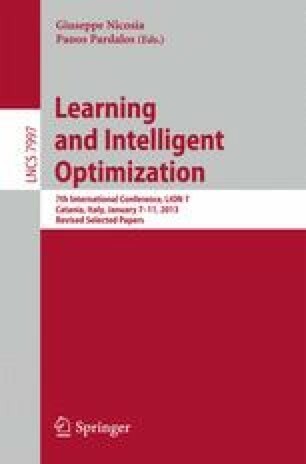 An indicator-based evolutionary multiobjective optimization algorithm (EMOA) is introduced which incorporates the contribution to the unary R2-indicator as the secondary selection criterion. First experiments indicate that the R2-EMOA accurately approximates the Pareto front of the considered continuous multiobjective optimization problems. Furthermore, decision makers’ preferences can be included by adjusting the weight vector distributions of the indicator which results in a focused search behavior. This paper is based on investigations of the project D5 “Synthesis and multi-objective model-based optimization of process chains for manufacturing parts with functionally graded properties” as part of the collaborative research center SFB/TR TRR 30 and the project B4 = C4 of the Collaborative Research Center SFB 823, which are kindly supported by the Deutsche Forschungsgemeinschaft (DFG). In addition, the authors acknowledge support by the French national research agency (ANR) within the Modèles Numérique project “NumBBO - Analysis, Improvement and Evaluation of Numerical Blackbox Optimizers” (ANR-12-MONU-0009-03).